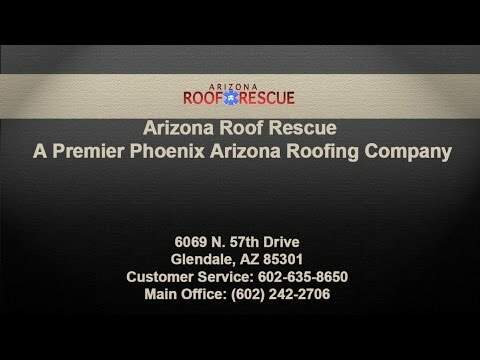 Arizona Roof Rescue is a Phoenix Arizona roofing contractor, with affordable pricing, great reviews, and a wealth of experience. You can’t be a roofing contractor for as long as we have, and receive reviews from customers as good as ours, unless you are truly a professional Phoenix roofing company offering affordable prices. We are licensed by the Arizona Registrar of Contractors to perform residential roof repairs, new roof installation, and Phoenix commercial roofing services. Our phoenix based roofers are the best in the business, and can fix everything from leaks and missing tiles to gaping holes and entire re-roofs. Our Phoenix Arizona roofing professionals have operated in the Phoenix area for over 6 years, providing quality repairs and maintenance services, beautiful new roof installations, and affordable emergency leak repairs for homes and businesses alike on all tile, shingle, flat, rolled, foam, and metal roofs. Your Phoenix roofing system is one of your home or businesses most valuable tools. By having a leak free, fully sealed roof, you prevent heat from entering. This causes your energy usage for cooling your building in summers to drop dramatically, saving you money in the short and long-term. By keeping your roof in tip top shape, you also avoid allowing the harsh Phoenix weather and Arizona’s monsoon storms from seeping in and affecting your buildings supports, drywall, and valuables kept inside. Is your Phoenix commercial property or building in need of professional roofing services? Contact Arizona Roof Rescue today to receive a free quote on your Phoenix roofing system from a licensed Phoenix roofing professional. We can help you find a roof that best suits your building’s characteristics, style, and functionality needs.